Issue 8.5 is now online! 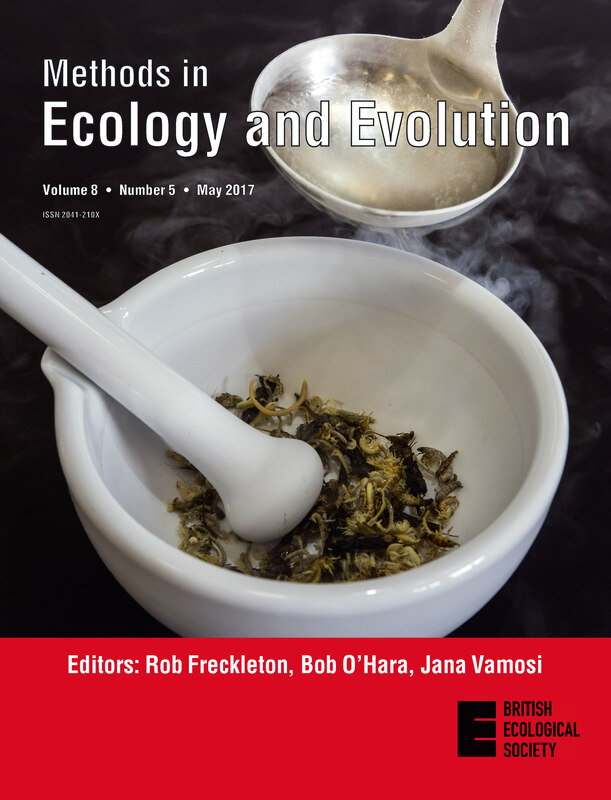 The May issue of Methods is now online! This issue contains three Applications articles and two Open Access articles. These five papers are freely available to everyone, no subscription required. – MatlabHTK: A software interface to a popular speech recognition system making it possible for non-experts to implement hidden Markov models for bioacoustic signal processing. – PrimerMiner: The R package PrimerMiner batch downloads DNA barcode gene sequences from BOLD and NCBI databases for specified target taxonomic groups and then applies sequence clustering into operational taxonomic units to reduce biases introduced by the different number of available sequences per species. – BarcodingR: An integrated software package that provides a comprehensive implementation of species identification methods, including artificial intelligence, fuzzy-set, Bayesian and kmer-based methods, that are not readily available in other packages. This month’s first Open Access article is ‘A new family of standardized and symmetric indices for measuring the intensity and importance of plant neighbour effects‘ by Rubén Díaz-Sierra et al. Measurements of competition and facilitation between plants often rely upon intensity and importance indices. The authors introduce a new family of indices ‘Neighbour-effect Indices’. It is the first of its kind, and it is generally more suitable for assessing competition and facilitation intensity than the widely used Relative Interaction Index, which may underestimate facilitation. Determining the timing and location of reproductive events is critical for efficient management of species. In our second Open Access article – ‘An environmental DNA-based method for monitoring spawning activity: a case study, using the endangered Macquarie perch (Macquaria australasica)‘ – Jonas Bylemans et al. conducted an experimental and field study to determine the influence of spawning, and the mass release of spermatozoa in particular, on environmental DNA (eDNA) concentrations. They show that changes in the relative abundance of nuclear and mitochondrial eDNA can be used to monitor spawning activity of the endangered Macquarie perch. The method is likely to be transferrable to other aquatic species. Our March issue also features freely available articles on Community Ecology, Quantitative Genetics, DNA Barcoding, Behavioural Ecology and more. This issue’s cover image shows a sample of larval invertebrates being prepared for DNA metabarcoding. Macrozoobenthic organisms are widely used to assess stream ecosystem health. Traditionally, this was done by morphological determination. However, the mostly larval specimens can often not be reliably identiﬁed to species level. DNA metabarcoding provides reliable solutions here. Rather than studying individual specimens, the complete invertebrate sample is thoroughly homogenised using liquid nitrogen for DNA extraction of the whole community, as shown on the picture. Then a speciﬁc “barcoding” gene fragment is ampliﬁed using PCR, sequenced on a high-throughput sequencer and compared against available reference databases for taxonomic assignment. As benthic communities are usually very diverse, the PCR primers have to be designed to work on all the targeted groups like may- stone- and caddisﬂies, aquatic beetles and molluscs. Here the R package PrimerMiner assists in primer development by automated batch downloading and processing of sequence data from public databases, as well as visualising sequence diversity for each group to ﬁnd potential universal primer binding sites. This entry was posted in Journal updates and tagged Aquatic Organisms, bayesian methods, Bioacoustics, conservation, DNA barcoding, ecology, Invertebrates, Neighbour Effect Indices, open access, Spawning Activity by Chris Grieves. Bookmark the permalink.